Fresh Hostel Kazan i Kazan, Russland: Bestill nå! Wellcome to Kazan! If you want to spend your trip in the safe and cozy place, our hostel for you. Just a stone’s throw from the city’s shopping streets, museums and vibrant nightlife. Fresh Hostel Kazan is a great place to base yourself to get the most out of this exciting and absorbing city. Everything is near: Kremlin subway station (2 minutes), several bus stations, shops, restaurants, the most popular bars and clubs, like Twean Peaks, Coyote Ugly etc. Also we have many interesting places for kid's entertainment within walking distance: Park Shurale, Kazan Circus, Cinemas and many others. 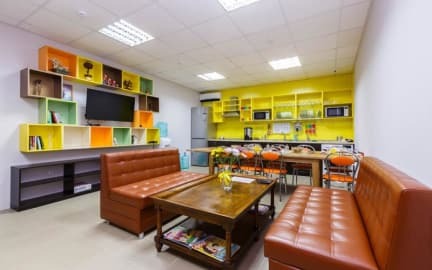 Fresh Hostel Kazan provides cozy beds with fresh sheets and towels, kitchen with all facilities (fridge, table, microwave, stove and some common food, like tea, coffee, fresh water etc. ), shower, toilets, lounge room with TV, sofa, books and board-games. Each room at this hostel is air conditioned. Every bed has an individual curtain. Guests can use a safety deposit box and cook their own meals at the fully equipped kitchen. Each room is fitted with a shared bathroom. You will find a 24-hour front desk at the property. Breakfast not included - 125 RUB per person per day. For extra payment laundry and filling breakfast.